When singer HyunA parted ways with Cube Entertainment after going public with her relationship with fellow singer E’Dawn, many fans, particularly those outside Korea, did not seem to understand the fuss. “This is one thing I really don’t understand about the Korean entertainment industry. These performers don’t belong to the fans or the companies who manage them. Let them date or marry who they want ... they’re entitled to a life of their own,” one Twitter user said of the dating scandal. Emotions ran high as HyunA and Cube Entertainment went back and forth in a weekslong public battle. During the course of the scandal, the agency was reported as saying the trust with the singer was “broken beyond repair” as the singer made her relationship status public without consulting them. HyunA’s handwritten letter in which she wrote that her only sin is to have worked beyond her limit and helped her former agency stand where it is now also garnered attention. While the scandal involving the two appears to have calmed down, dating still remains a taboo for many idol trainees, according to Lee Jong-im, a researcher at the Center for Culture & Society. “While some might have doubts and complaints and agencies have their expectations, trainees have been conditioned to refrain from (dating) in order to succeed,” Lee said who interviewed idol trainees for her research on K-pop trainees. “Some trainees want to keep an impeccable private life and have nothing get in the way of their success while others complain about having their private life micromanaged, such as with dating,” Lee added. Dating bans have been openly acknowledged by some pop stars. 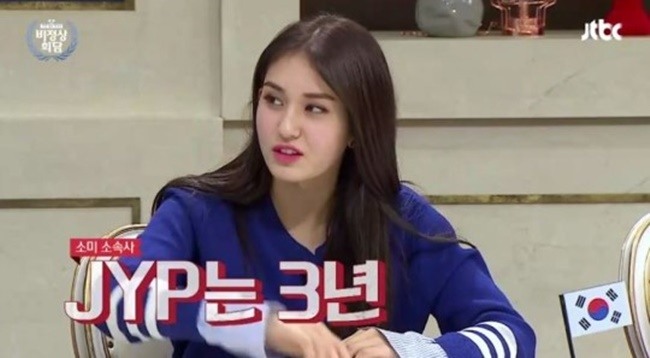 Singer Jeon So-mi said during an appearance on TV show “Non-summit” in 2016, when she was still signed to the company, that JYP Entertainment restricts its artists from dating for three years. JY Park, the CEO of JYP Entertainment, also wrote in a tweet in 2015 that there was a three-year dating ban at his company, during which trainees are encouraged to focus on practicing and refrain from dating and meeting friends. He added that trainees and stars are not restricted from dating after three years. Jisook, a former member of the girl group Rainbow, went the extra mile to work around a dating ban. South Korean entertainment agencies are thought to take indirect approaches to the issue of dating. “Some trainees had to send an update while being interviewed, while some still in high school decided to cut ties with friends in school voluntarily in order to avoid any unwanted attention,” Lee said while adding that some idol trainees are advised against dating by their agencies, instead of having legal clauses against it in their contracts. “Trainees practice in a separate studio segregated by gender until 10 and 11 p.m., depriving them of an opportunity to mingle and leaving them with no time to meet anyone,” the researcher said. K-pop is a business-driven industry where profitability overrules privacy, and relationship status has a direct impact on one’s popularity, Lee said, with the result that singers’ private lives become part of the whole package, a commodity. Lawyer and former spokesperson of the Korean Bar Association No Yeong-hui told The Korea Herald that dating bans would not stand up well in a civil law case. “While celebrities need to respect the relations with their company to a degree, there are basic rights that need to be protected. Even if the stock price falls and profit matters, it’s unjust to compel people to suppress their instincts because celebrities are a commodity and (their behavior) could affect business negatively,” the lawyer said of the scandal surrounding HyunA’s relationship while appearing Kim Hyun-jung’s News Show earlier this month. No, who has helped idol trainees sign contracts, however, said there are ways around the law to ban idols from dating, such as damage limitation clauses in contracts that force idols to pay a significant amount of money when causing “harm” to the agencies. Pressure to debut and be successful is another tool, No told The Korea Herald, citing boyband The East Light, members of whom recently broke their silence on years of alleged abuse from their boss. Lee Seok-cheol, the leader of the band, came forward with shocking revelations that he allegedly suffered years of physical and verbal abuse in a press conference in October. He claimed his producer threatened to ruin his career if he told anyone about the abuse, which stopped him from telling even his mother.